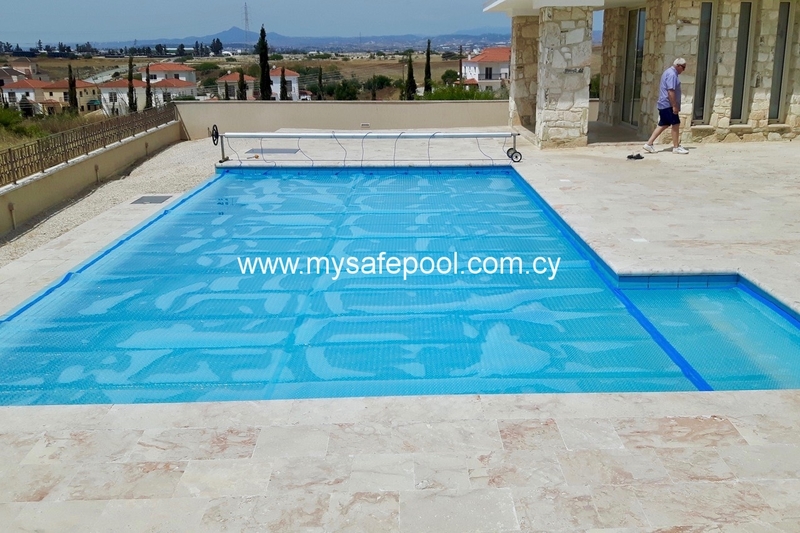 Just a short message to tell you we are very happy with the pool cover. Remarkable reduction in water and chemical supply. And the water is still nice and comfortable at 29°C (late October). WHAT IS A SOLAR COVER? 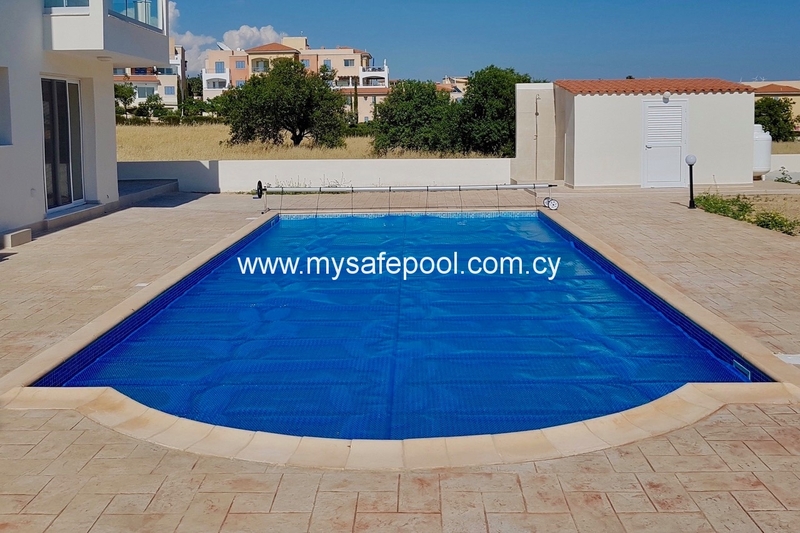 A solar cover is a lightweight thermal blanket which is laid loose on top of a swimming pool. 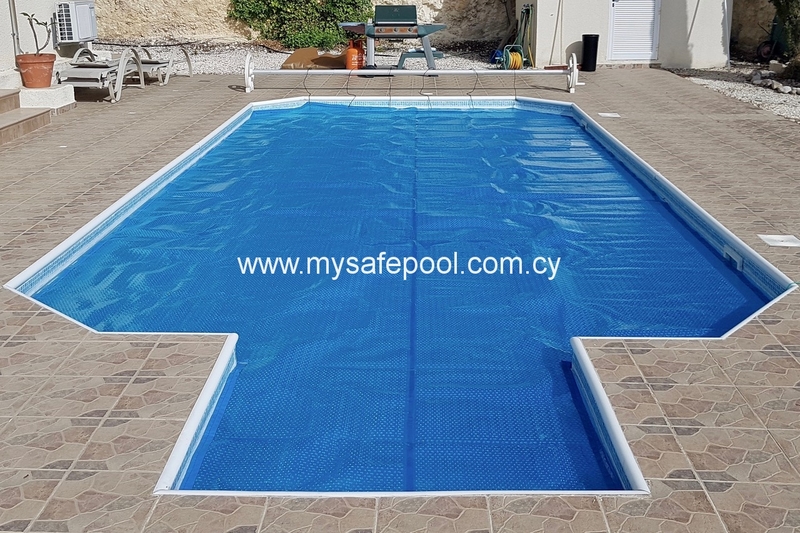 Made of translucent plastic material, a solar cover incorporates specially shaped air bubbles within the extrusion which absorb the sun’s rays, so that water in the pool is warmed by 4-8°C. At night-time when the ambient temperature is cooler, the bubbles act as an insulating layer to minimize heat loss from the pool. 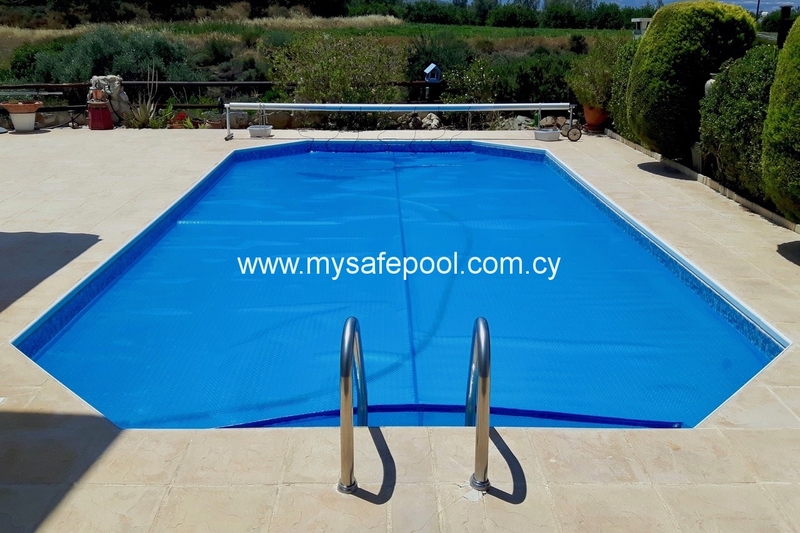 Solar covers are widely used in spring and autumn to extend the swimming pool season. 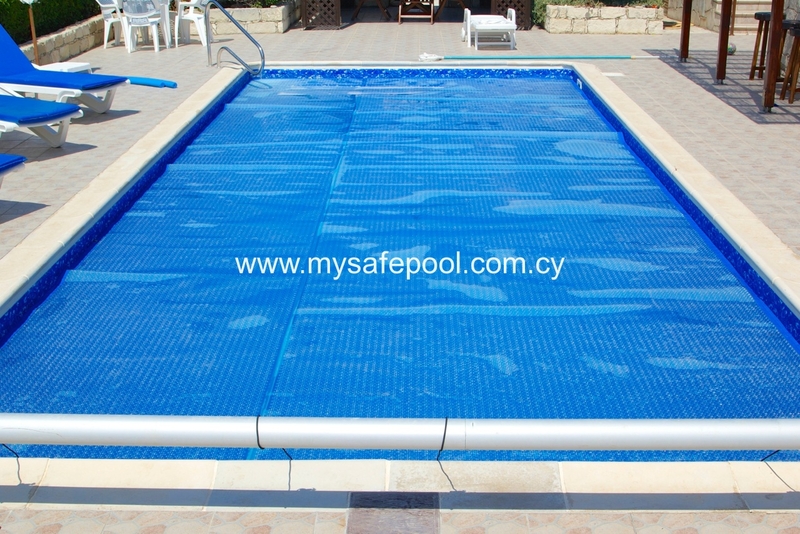 This enables owners to get more use out of the pool and enjoy more comfortable water temperatures. WHAT ARE THE ADVANTAGES OF A SOLAR COVER? A solar cover uses radiated heat from the sun to warm the pool for free. At night-time, a solar cover greatly reduces heat loss to the atmosphere. If your pool is heated, using a solar cover can reduce heating costs by up to 70%. A solar cover reduces water evaporation by up to 98%. A solar cover lessens chemical consumption. A solar cover keeps leaves, debris, bird droppings and birds out of the pool. Our premium grade 460g/sq.M “Aresti” material which is 500 micron thick. This material is without doubt one of the most robust and durable solar covers on the market today. Translucent with a hint of turquoise, Aresti comes with an outstanding 3-year guarantee. Our lower price 368g/sq.M “Artura” cover, which is 400 micron. This cover, translucent blue in colour, combines quality of product with a long working life and a 2-year guarantee. HOW ARE OUR SOLAR COVERS DIFFERENT? “Aresti” and “Artura” are new, third generation designs which incorporate kidney-shape bubbles. These allow room for expansion as the air inside the bubble heats up. The material is thicker too – 50% more than a standard bubble. This product delivers ultimate heating and insulation properties along with a remarkable resistance to UV and pool chemicals. Together these qualities result in a greatly extended product life. WHAT ABOUT SHAPE AND SIZE? We custom manufacture each cover to perfectly fit a pool’s unique shape and size. This includes Lazy-L and kidney-shaped pools, Grecian, mini-Grecian and rounded corners, plus Roman and walk-in steps. HOW ARE THE EDGES OF THE COVER FINISHED? Our covers normally come hemmed with PVC tape at each end of the cover, together with eyelets. As an option we can hem all four sides of the cover. Hemming the cover protects the edges from abrasion. HOW EASY IS IT TO USE A SOLAR COVER? 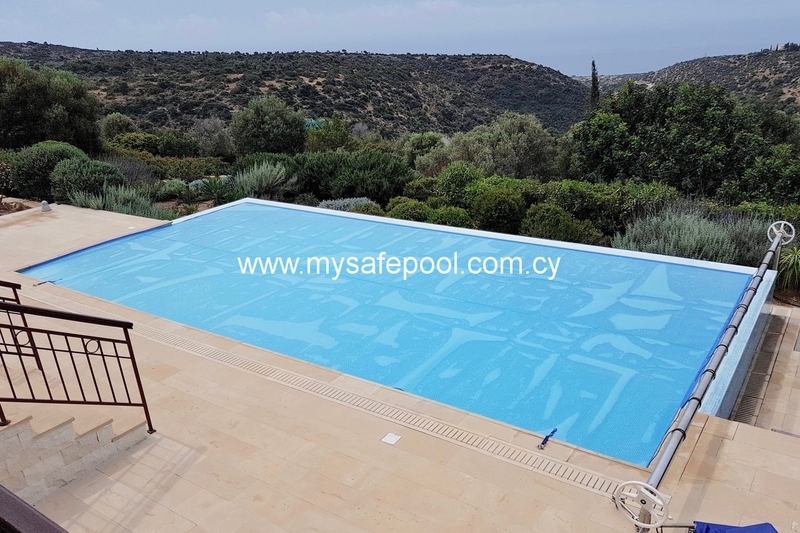 Our Artemidos Roller makes it easy to lay a solar cover on the pool, and then take it off when the cover is no longer required in place. HOW MUCH DO OUR SOLAR COVERS COST? 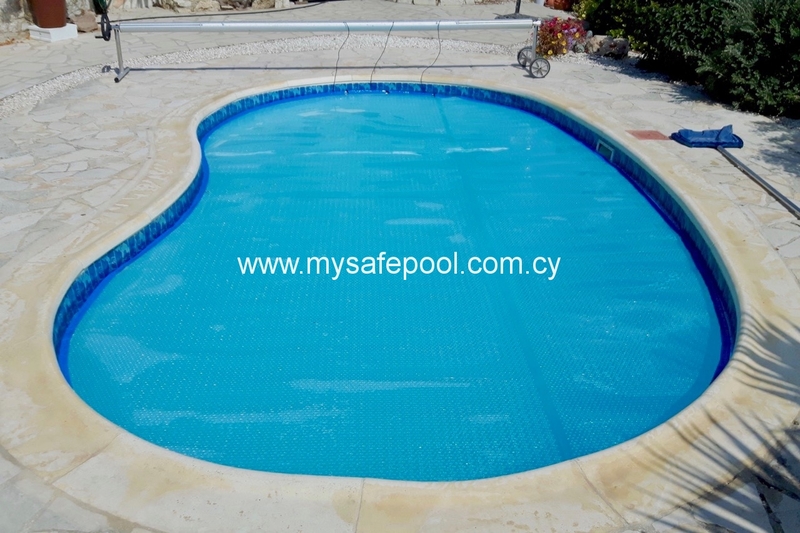 Start by emailing us some photos or a plan of your pool, together with dimensions. Alternatively, call us. We’ll quickly come back to you with a quotation. WARRANTY: Our 3-year (Aresti) and 2-year (Artura) guarantees are pro-rated and conditional on the solar cover being protected from the sun when rolled up on the roller. We can supply a special UV-protective cover for this. 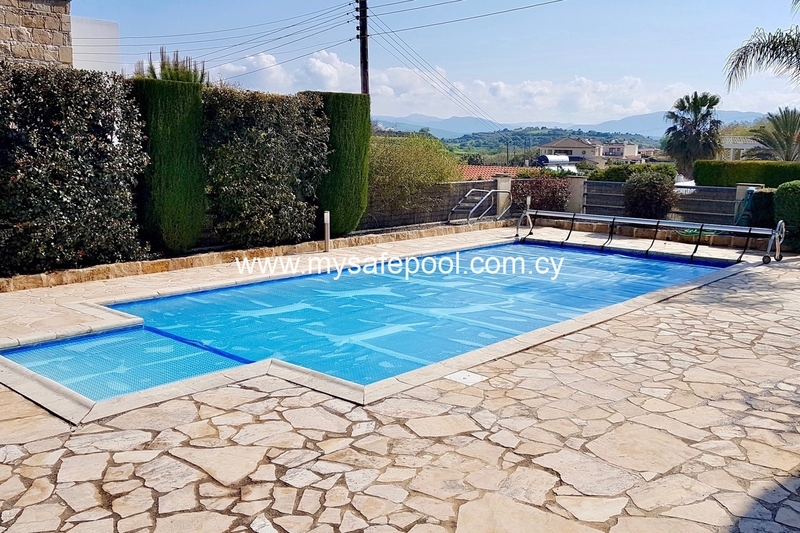 CAUTION Unlike a safety cover or winter debris cover, a solar cover is not secured to the edge of the pool and can be dangerous if a person – particularly a child – falls onto the cover. Do not swim under a solar cover. Be careful and never leave a child near a pool without responsible adult supervision.